Partially cooking or parboiling sweet potatoes can speed up preparation time for roasted or grilled sweet potatoes, sweet potato fries, or sweet potato casseroles. You can parboil sweet potatoes right before baking them, earlier in the day or even the day before you plan to finish your dish. Partially cooking sweet potatoes can make these slow-cooking vegetables a weeknight-ready favorite. Decide how you plan to prepare your sweet potatoes. Parboiling sweet potatoes is an effective way to shorten the total cooking time for nearly all sweet potato recipes. If you plan to use whole sweet potatoes, scrub thoroughly with a vegetable brush to remove dirt and debris. Chopped, sliced or julienned sweet potatoes should be peeled, rinsed and patted dry before cutting. Cut the sweet potatoes as desired. Fill a medium to large saucepan one-half to three-quarters full of water. Bring the water to a boil. Add sliced, diced or whole sweet potatoes to the pot. Boil quartered or sliced sweet potatoes for five to seven minutes. Allow 10 to 12 minutes for whole sweet potatoes. Remove the sweet potatoes and drain once they are starting to get tender. The sweet potatoes should not be fully cooked. If you are pre-cooking sweet potatoes to use later in the day or the following day, drain well. Transfer the sweet potatoes into a plastic storage container and refrigerate. 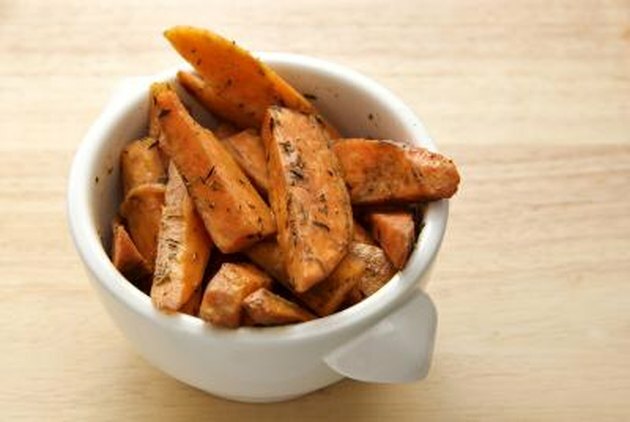 Do not leave pre-cooked sweet potatoes at room temperature unless you plan to finish cooking within one to two hours. Use your pre-cooked sweet potatoes in a variety of recipes, seasoning them as desired. Reduce the cooking time by 50 percent to 75 percent, depending upon the recipe. Sweet potato fries will finish cooking in approximately ten minutes, while a baked or grilled sweet potato may need thirty minutes. Check the sweet potatoes frequently. They should be tender and lightly browned, if you're roasting them.